Station, from Air Monitor Corporation. A Combustion Airflow (CA) Measurement Station is a multi-point, self averaging pitot traverse station designed to provide accurate and repeatable primary, secondary and/or tertiary airflow measurement in gas, oil or coal fired power plants. Accurate combustion airflow measurement is a key element in meeting the twofold objectives in the power industry; lowering emissions, and increasing plant performance through combustion efficiency. Precise measurement of combustion airflow and fuel rates contributes to the achievement of those objectives by providing information needed to optimize fuel to air ratios and facilitate more complete, stable combustion. 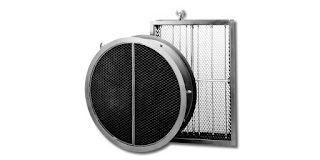 Limited available straight duct runs, low airflow rates, sensor proximity to modulating control dampers, broad turndown range requirements, and high concentrations of airborne particulates inhibit the use of many other measurement methods in obtaining usable measurements. The CA Combustion Airflow Measurement Station, from Air Monitor Corporation, is detailed in the document included below. More information is available from application specialists. Share your airflow measurement challenges of all types with experts, leveraging your own knowledge and experience with their product application expertise to develop effective solutions.